In the 1890s, hundreds of young Japanese immigrants arrived in Oregon to work on the railroads, lumber mills, farms, and fish canneries. Portland was the hub from which these Issei, mostly young bachelors, found work in the surrounding areas, or stayed and began to work in Portland. The area of Portland by the Willamette River north of W. Burnside Street became known as Japantown. By the 1910s, many men had become more established and began to arrange for brides. In 1920, there were 1,349 Japanese women living in the state. With the start of many new families, Portland's Japantown grew to become a thriving heart of the Nikkei community, a central business district that was home to many families, schools, sports, and social activities. By 1940, there was a concentration of over 100 businesses located within a six or eight block area. Nihonmachi was a busy place, where the Japanese would come to buy Japanese food, receive dental and medical care, find legal assistance, and take care of their banking needs. Japantown disappeared suddenly in the spring of 1942, when all persons of Japanese ancestry were removed from the West Coast and placed into concentration camps. 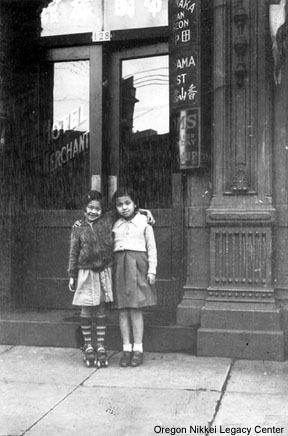 Yet for those who remember the old Portland, the echoes of Japantown can still be heard today. This collection is a brief history of Portland's Japantown, presented by the Oregon Nikkei Legacy Center with special thanks to George Katagiri. Please contact the Legacy Center for additional information. Enjoy! Oregon_Nikkei — Last modified Apr 24 2013 1:15 p.m.